Being a caregiver for an ailing parent, spouse, child, or other loved one can feel like a lonely undertaking. It needn't, even if you don't have family nearby to pitch in. Help for caregivers is available from various organizations. Once you learn what's available, it may be easier to chart a less-demanding course toward meeting the needs of your spouse, relative, or friend. Adult day services. These programs offer comprehensive packages of assistance, though what's in the package varies from place to place. Services may include transportation, nursing care, meals, personal care (such as help with bathing or toilet use), social opportunities, or rehabilitative activities. Such facilities are immensely helpful if your loved one needs supervision or assistance with daily activities, health care, or social support for physical or cognitive impairments. Typically, adult day services are open during normal business hours. Some offer evening and weekend hours. Certified nurses aides. These trained aides can help with activities of daily living, such as bathing, dressing, and personal care. Keep in mind that they are not nurses, and so can't administer medications. Hired companions and homemakers. You may want to hire someone to help with meals, shopping, and laundry; supervise activity; and provide companionship and transportation. Some people may also be willing to help with personal care. An informal arrangement—such as a college student who lives in a home and provides help in exchange for rent—can work well. Home health aides. These aides perform personal services such as bathing and dressing, and may do light housekeeping. Meal programs. Hot, nutritious meals may be available through programs like the Meals on Wheels Association of America (703-548-5558, or www.mowaa.org) or the federally funded Eating Together Program, which offers lunch and companionship at community centers. Senior centers, community groups, or religious organizations may have similar services. Case managers. Some hospitals and health insurance plans assign case managers to oversee and coordinate health care. Case managers are often registered nurses or social workers. They help coordinate services, keep tabs on a patient's progress, and communicate with the patient, caregiver, family, clinicians, and key departments, such as billing. Nurses. Nurses offer skilled nursing care, such as inserting intravenous lines, cleaning wounds, and changing bandages. They can also administer medications. Physical, occupational, or speech therapists. These trained professionals may do in-home therapy sessions. Respite care workers. 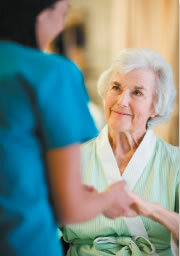 Respite care workers provide caregivers with time off from their caregiving duties. Transportation services. Some communities offer free or low-cost transportation to medical appointments for seniors or people who are disabled. Other potential sources of free or low-cost transportation help are religious and community organizations, such as churches or synagogues, councils on aging, and senior centers. The United Way (www.unitedway.org) and other national organizations may be able to refer you to services in your community, useful information, and assistance. For example, the Alzheimer's Association (www.alz.org) offers a 24-hour help line (800-272-3900) and support groups throughout the country. Some of its chapters also offer training programs, assistance with coordinating care, and other services. For more on developing plans and effective strategies for the hard work of caregiving, buy Caregiver's Handbook, a Special Health Report from Harvard Medical School.